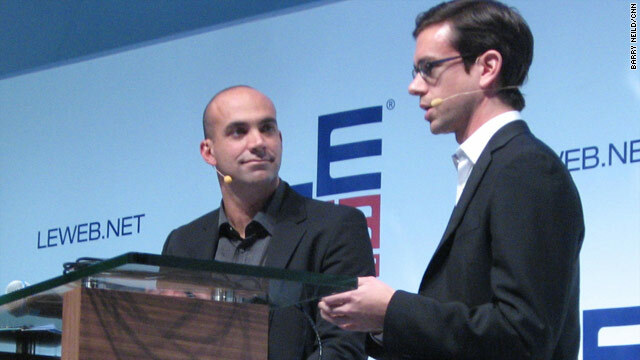 Twitter founder Jack Dorsey, right, with LeWeb host Loic Le Meur, at the unveiling of "Square." Paris, France (CNN) -- Twitter creator Jack Dorsey Wednesday gave the first public demonstration of his hotly-anticipated latest venture -- a device to allow credit card payments by cell phone -- and revealed it would be given away for free. Details of "Square" -- a card reader which plugs into the headphone socket of most mobile devices -- have been circulating on the Internet since it was announced earlier this month, but little has been known about how it works or who it was aimed at. However, Dorsey -- whose microblogging Web site has proved hugely popular but not hugely profitable since launching in March 2006 -- gave no explanation on how he would make money from his new creation, beyond revealing there would be a per-transaction charity donation. Customers then use their finger on the phone's touch-recognition screen to sign their name to the transaction. Dorsey, Twitter's co-founder and chairman, says the device, scheduled for launch on iPhones and iPods in March 2010, was inspired partly by the "immediacy, approachability and transparency" of Twitter and by the global economic crisis which has exposed a need for a radical rethink of the financial sector. "The financial world is amazing right now because there's a clean slate. A lot of these industries are looking for something very small and innovative," he said during the gremlin-hit demonstration of his device at LeWeb, a major Internet forum in Paris. "My co-founder is a glass artist. He sells things that people don't need -- $2,000 glass faucets. They're beautiful. If he could not take credit cards, he wouldn't make the sale because no one carries around $2,000 in the cash. "So we looked at it. Ninety percent of the U.S. has moved to credit cards, but it's still very difficult to accept them." "The other thing we looked at is the audio jack -- and it's on Macbooks, desktop PCs, BlackBerries and Androids. We built this hardware. It's a self-powered swiper. Powered by the magnetic power of the swipe itself, converts it to an audio signal, which the software interprets." "We're trying with a bunch of different profiles of folks in New York, San Francisco, LA and St. Louis, Missouri. There are piano teachers, flight instructors, and coffee shops. It can be used in a retail store like Apple, all the way down to Craigslist or paying me back for that dinner you owe me."